There is always something very special about bands making music that sits outside time and fashion and if lead single, Fairytale Tourist, hinted at this quality in The Corner Laughers then it still didn’t prepare me for what was to follow on the full album. Their brand of Sunshine pop is just what the world needs to remind us of the joy of making music rather than the cynical careerism that seems to be the norm these days. By taking liberal doses of 60’s girl bands, soul, folk and acid-tinged pop, the infectiousness of The Beach Boys, the retro psychedelia of Redd Kross or Jellyfish, plus no small amount of fun, optimism and joyful abandonment, they have quite possibly created the perfect pop album. Let me repeat that, THE PERFECT POP ALBUM! 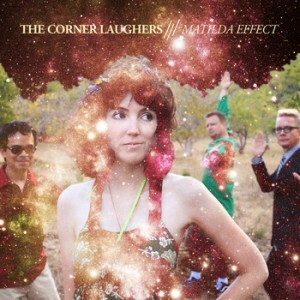 Whilst others preen and pose to look cool, The Corner Laughers effortlessly ooze said cool without even trying. More earnest bands may be trying to predict fashions and play the game of looking the part but The Corner Laughers are happier speeding along the highway towards the beach with the radio on and the top down. And whilst you concentrate on Matilda Effects’ gloriously celebratory, life affirming and fun nature it is easy to overlook how wonderfully produced the album is. It is clean-limbed and polished to perfection, a brilliant balance of solid, tight, well separated playing and the dreamy vocals that Karla Kane does so well. If you miss albums full of innocence, music woven from lost childhood summers, fairground wonderment and fairy-tale expectations, then this is for you. Did I mention that it is the perfect pop album?